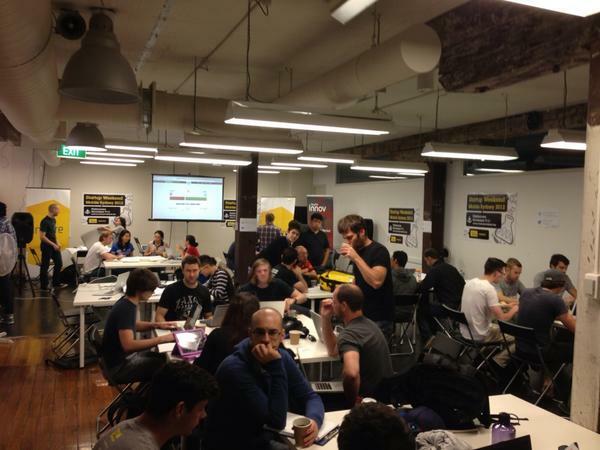 Images in this post are from those posted by Barry (@nolim1t) and other participants via Twitter at #swsyd. Generally, my Monday mornings on the train to work are spent feeling exhausted and half asleep because the weekend is when I play catch up on all the housework that I’ve left undone during the week. But today, it’s because I spent a hectic 48 hours participating in Start Up Weekend Sydney. 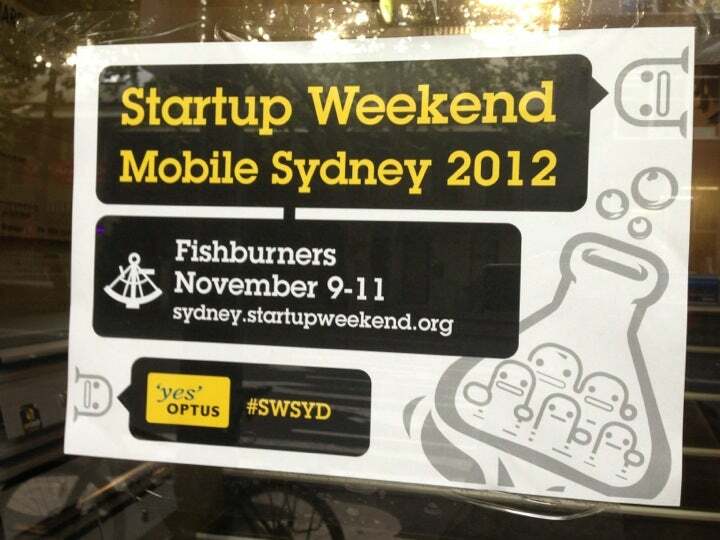 Start Up Weekend Sydney at Fishburners on Harris Street, Ultimo. I can’t even remember how I heard about Start Up Weekend Sydney, I think it was through the magical process of clicking through random links on the internet, and I found it early enough that tickets were still at the early bird registration price of $75. Whilst I have had a history of entrepreneurial tendencies (starting from primary school projects, then running a Young Achievement Australia program company, right through to specialising in the entrepreneurial/strategic growth market sector in my career to date), I didn’t think I would actually achieve anything over the weekend. I signed up thinking that I’d just get a decent feed and maybe meet some cool people. Start up frenzy on Day 2 of Start Up Sydney Weekend. What I did not expect was that I would walk out of there completely inspired, feeling like I can do anything I put my mind to, and with a bunch of amazing new friends. I’ve read stuff from Ramit Sethi (of IWillTeachYouToBeRich.com fame), including the Earn1K course, and intellectually I understood the whole “getting inside customers’ heads” and the focus on getting your first three paying customers. I still have no idea why I didn’t just go out there and actually do it. I think I kept making excuses like “it’s going to take a lot of time which I don’t have” and being terrified of actually going out there and asking people stuff (ugh, or worse trying to sell people stuff). But when I actually went out there during SWSYD weekend and started speaking to people on the street, it actually wasn’t that bad. Here is what I learned. If I could do over the weekend, I would have made sure that the minute we got agreement on our rough vision was the minute we walked out the door and onto the streets to validate that vision with actual customers. Instead, we spent waaaaay too long inside a building talking to each other, refining lengthy surveys, spending time on minutiae like logo fonts and colours and generally confusing ourselves; instead of pounding the pavement and speaking to our target customers. By the time we finally got out there, it was quite late in the day. I only talked to the general populace on the street (i.e. at Pitt Street Mall, Myer Food Court and Westfield Food Court) from 6:40 PM on Day 2 of the event and kept going until about 7:40 PM. This was the ONLY time the whole weekend that I spent talking to random people on the street. During that time, I approached 24 people in total, 2 of whom declined to speak to me, 6 of whom were “passive observers” (i.e. was with someone willing to speak to me but didn’t talk to me), and 16 of whom were willing to answer my survey questions. Of those 16 people I interviewed, 11 people were interested in our product/service and willingly gave me their email addresses. 4 of them would have been willing to pay for our product/service. My customer validation results. It was not nearly as scary as I thought it would be. You’ve probably heard the expressions “good ideas are a dime a dozen” (Unknown) and “genius is one percent inspiration and ninety-nine percent perspiration” (Thomas Edison). Ideas are not hard to come by, yet for all these years I kept thinking that every idea either wasn’t good enough to act on or I didn’t know enough to act on it and so I did nothing. This weekend, it really hit home that a great idea can be ruined through terrible execution, and in fact perform more poorly compared to an average idea which is solidly executed. And when you realise that, you start to understand that the key driver of results is not having the ultimate magical idea to end all ideas, but having the right people on your team all working towards the same vision. 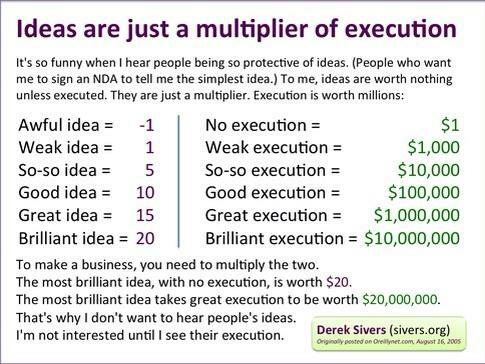 Ideas are just a multiplier of execution (Derek Sivers). The idea we were pitching was an app to connect up and coming local comedians with like minded comedy fans, by letting the fans play short clips of their material and suggesting new material based on their viewing behaviour. 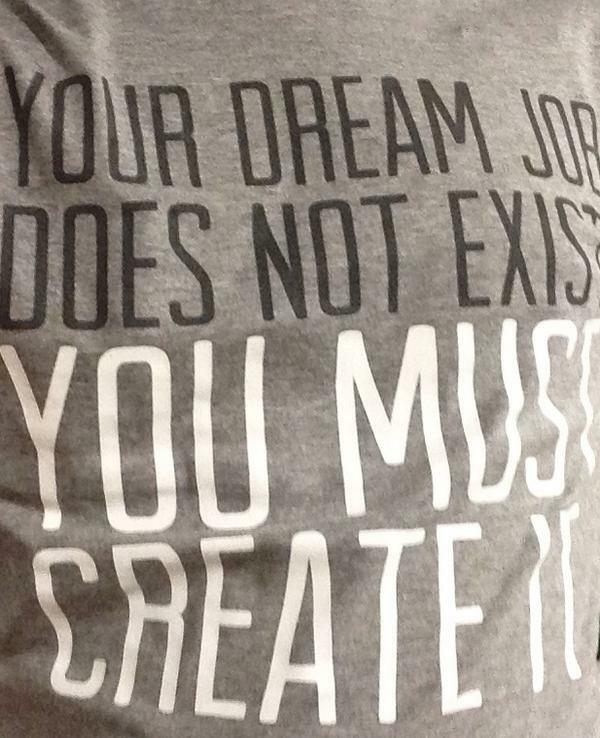 Screenshot of a t-shirt pitch, courtesy of fellow #swsyd team Start Up Puns (startuppuns.com) - "We are the StumbleUpon for Comedy." Hi, I’m from The Comedy Hunter. We sift through the garbage for the great comedy so you don’t have to. Would you like to sign up for a paid three month subscription to our mailing list? Now in hindsight, it’s pretty obvious that walking up to someone with a ten second pitch followed by asking for money does not work, no matter how good your pitch (and as an aside, this pitch wasn’t stellar). Thanks to years of working in a client facing professional services firm, I’ve gotten good enough at reading people that I didn’t even try to approach people who refused to make eye contact with me, let alone hard sell anyone who was willing to talk to me. Plus, I was so apprehensive about approaching random people on the street that I did what I normally do when I’m nervous which is turn up my “bubbly-ness” by three hundred percent and opened with small talk and gradually escalating my requests with each question. Hi, I’m from The Comedy Hunter, a small start up here in Sydney and we’re doing some market research today. Would you have two minutes to help me answer a few questions? Great! The first one is very easy: who is your favourite comedian? Second, how often do you go to comedy shows? Third, would you download a mobile app which would allow you to watch short clips and recommend new material based on what you like? Finally, would you be willing to pay for this app? Thank you so much for helping me out! Would you like to be notified through email when we launch our app? My conversion rate of emails received from people approached was about 50% in my first hour which surprised me. I’m sure if I had picked a better time of day when more people were around and not rushing off home from work or out to dinner, plus more time to test out variations on my script, I would have gotten some higher response rates. Now I didn’t sell anything, nor did I get any cash, but I did get a lot of personal contact details, which considering that each conversation took on average just under four minutes, that’s a fair amount of trust established. But that brings me to the final point. If your idea requires technology to be successful want to launch fast and become cash flow positive, you need a good dev on your team who can build a minimum viable product that can later be expanded upon. You can get pledges to a concept, but you can’t convert the pledges to cash in hand. Every single team that did bring in cash had built a working prototype that they had launched and were demoing around when they were making their sales pitches. And if you’ve done your customer validation properly, it means you’ve really gotten inside your target market’s heads so the value of your product/service can be clearly articulated. Even if you don’t necessarily have your product or service fully built, because you can show them this working prototype which is addressing their core pain points and solving their problems, they have no hesitation in reaching for their wallet. We didn’t win the competition this weekend, but we learned a lot, and what I learned was worth more than any prize. The whole Start Up Weekend Sydney experience has been amazing and it’s given me so much more confidence in my instincts and abilities. I’ve always felt a bit useless as a BCom(Accounting/Finance). Not only did my classes basically comprise of learning a lot of commonsensical and nonsensical rules by rote, I felt like I didn’t bring anything useful to the table, plus I didn’t believe that I was good at selling. Just three days ago, I would never have thought I could have convinced eleven complete strangers to sign up for a product that didn’t even exist in beyond a rough concept, or gotten expressions of interest from multiple comedians and comedy venues in the idea. Maybe – just maybe – this whole Broadway dream is a whole lot more possible than I originally thought. Great write up Deb – I think the learning on the sales/BD is really good. The idea where you get a tune from your head, through your voice and immediately onto a music sheet is cool!! Shazam in reverse.